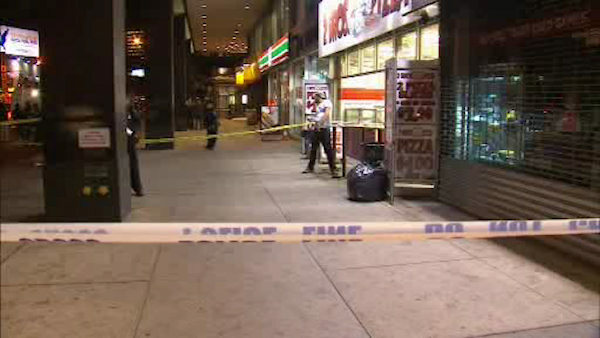 NEW YORK (WABC) -- Police have arrested a teen in a double shooting in Brooklyn earlier this week. Malik Peters, 17, of Brooklyn, was arrested and has been charged with second-degree murder, second-degree attempted murder, and a weapons charge. He is accused of shooting two teens, one fatally, in downtown Brooklyn Monday evening in an apparent gang-related attack. The attack happened around 6 p.m. at the crowded intersection of Flatbush and DeKalb avenues in Downtown Brooklyn, across the street from a university campus and the entrance to a subway stop. Armani Hankins, 16, of Queens, was shot in the head, and was taken to Brooklyn Hospital where he was pronounced dead. An 18-year-old boy was shot in the ankle and taken to Methodist Hospital in serious, but stable condition. The two are believed to be members of an East New York-based crew named the "Four-Two-Five" who ran into a rival crew from Fort Greene. Police said members of the rival crew started the argument and then opened fire. The gunfire left shell casings scattered around the crowded sidewalk, and bullet holes in cars parked on Flatbush Avenue. One of the guns used was found a few blocks away.